Directional locomotion or taxis is possibly one of the most important evolutionary milestones, as it has enabled many living organisms to outperform their non-motile competitors. In particular, chemotaxis (i.e. the movement of organisms either toward or away from specific chemicals) is the most common strategy adopted by many unicellular organisms to gather nutrients, escape toxins and help coordinate formation of colonies. Recently, we demonstrated that chemotaxis can be achieved by creating a nanoscopic vesicle loaded with enzymes, whose membrane have an asymmetric distribution of permeable domains. When placed in the presence of a chemical gradient that act as substrate for the enzyme, the asymmetric distribution of flow across the vesicle membrane create a biased slip velocity around the vesicles and a consequent propulsion. This, in turn, allows the vesicles to move chemotactically toward higher concentration of the substrate allowing long-ranged targeted delivery. Here, we will expand this concept using uniquely biological molecules with the final aim to demonstrate that a minimal organisation of biomolecules can create the conditions for complex behaviour such as chemotaxis. 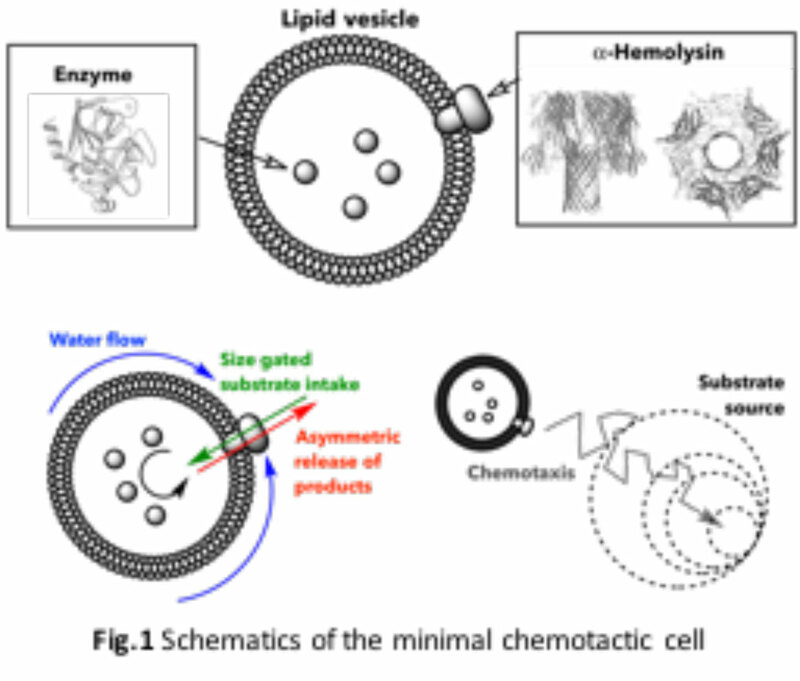 Fig.1 shows the schematics of the minimal cell, where we propose a simple vesicle formed by natural occurring phospholipids that encapsulate enzymes. This will be then placed in contact with pore forming α-Hemolysin. This protein unimers assemble to form an heptameric pore with a pore-diameter of 1.5 nm. The pore is selective for the passage of any molecules with mass lower than 1kDa as well as several cations including K+ , Na+ and Ca2+. We will encapsulate proteases and use short and long sequences of amino acids as substrate/signalling molecules. L. Song, M. R. Hobaugh, C. Shustak, S. Cheley, H. Bayley, and J. E. Gouaux. Structure of staphylococcal alpha-hemolysin, a heptameric transmembrane pore. Science, 274(5294):1859–1866, Dec 1996. L. Wang, L. Chierico, D. Little, N. Patikarnmonthon, Z. Yang, M. Azzouz, J. Madsen, S. P. Armes, and G. Battaglia. Encapsulation of biomacromolecules within polymersomes by electroporation. Angewandte Chemie Int. Ed., 51(44):11122–11125, 2012. The student will be trained in constructing and characterising the proposed nano-reactor as well as trained to measure anomalous diffusion using in house and commercial nanoparticle tracking systems. The project will involve the synthesis, purification and characterisation of synthetic vesicles. We will employ state-of-the-art flow field fractionation, dynamic and static light scattering as well as cryogenic and liquid state scanning transmission electron microscopy. The project will involve detailed diffusional analysis tracking packages to evaluate any anomalous diffusion pattern. Experience in MatLab or Python packages will be advantageous, however training will be provided.